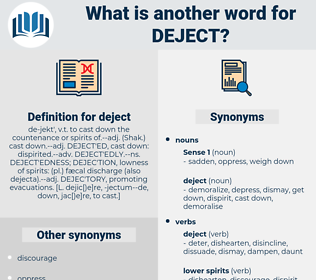 What is another word for deject? elevate, uplift, stimulate, buoy, lift, solace, brighten, please, animate, enliven, assure, hearten, boost, inspire, comfort, gratify, lighten, cheer, delight, reassure, soothe, invigorate, encourage, console, gladden, rejoice. detect, dogtooth, dakota, dust, dashed, dish out, dicky-seat, dacite, deck out, dugout, doughty, decked, decided, desiccate, decked out, degust, dictated, decode, due south, digitate, desist, dead set, dogwood, dead weight, digested, decade, dicot, dacoity, duckweed, dickie-seat, disquiet, deceit, dockside, disguised, digit, diseased, dagda, diskette, dog-sized, dighted, decayed, disgusted, dakoit, desiccated, death's head, dedicated, docket, do-si-do, decidua, destitute, dziggetai, disquieted, do good, dissect, duck shot, detoxicate, dissuade, dioxide, disgust, dytiscidae, discoid, dazed, detest, digest, De Sade, dickey-seat, decoct, dissociate, dictate, dodge city, dacoit, dosed, death seat, dejected, decussate, disassociate, die-cast, deduct, dished, death squad, dickhead, due west, duct, detached, dakoity, dusty, dissected, due east, dig out, dogged, detested, dedicate, deuced, desuetude, decide, deceased, detected, dasyatidae, deist, diazoxide, disquietude, disused, ducat.